The Associated Press should win an award for its latest piece on President Obama, titled ‘For Obama, world looks far different than expected.’ In short, author Julie Pace finds the nicest way possible to say that Mr. Obama is in way over his head and failing miserably. WASHINGTON (AP) — Nearly five years into his presidency, Barack Obama confronts a world far different from what he envisioned when he first took office. U.S. influence is declining in the Middle East as violence and instability rock Arab countries. An ambitious attempt to reset U.S. relations with Russia faltered and failed. Even in Obama-friendly Europe, there’s deep skepticism about Washington’s government surveillance programs. In some cases, the current climate has been driven by factors outside the White House’s control. But missteps by the president also are to blame, say foreign policy analysts, including some who worked for the Obama administration. President Obama’s track record offers the world further proof that conservatism will never perish. Like the wise father we rebel against in our youth, its lessons may not always be in style, but they will always be ready and waiting for us to accept. In 2008, Mr. Obama actually said that history would record his election as the moment in time the oceans began to recede. He won the Nobel Peace Prize for, essentially, not being George W. Bush — and then promptly created the “Terror Tuesday” kill list (also known by the much creepier name: The Disposition Matrix). He became the Marshall Applewhite of modern American politics. He and his supporters seemed to believe that through his sheer awesomeness he would convince former KGB agents (i.e., Vladimir Putin), Islamic extremists (e.g., Iranian mullahs) and brutal dictators (e.g., Bashar Assad) to change their ways. His Awesomeness has failed at bringing forth utopia, and it is only now that the Associated Press feels comfortable cluing independent voters in on the news. Boom. When you try and be all things to all people — when you stand for everything — you stand for nothing. When you promise the people utopia, you soon find yourself willing to go to places you once defined as the depths of hell in order to bring it to them. When you invest all your hopes and dreams into one man, he will let inevitably let you down. President Obama sat back and issued red lines and yellow lines and orange lines while 100,000 people were slaughtered in Syria, and now seems poised to act militarily with a “coalition of the willing” because Russian and Chinese thugs at the United Nations don’t care if your name is George W. Bush or Barack Hussein Obama — they will do what is in the best interests of Russia and China. The president has found out that whether he acts or not, nations around the world will blame the United States for the world’s ills because blaming America is easier than dealing with their own cultural rot and social detritus. It’s just sad that the Associated Press waited until the end of August, when people are at beaches and barbecues and family gatherings, to publish something resembling a true assessment of President Obama’s time in office. Previous Entry WSJ Fall Fashion issue: Is androgynous the new black? Speaking of Syria, I saw a picture on the front page of my local paper that showed people in Washington… protesting Obama’s inaction on Syria and ENCOURAGING him to intervene in that conflict. I just found it ironic considering how none of these protestors were encouraging Bush to go to Iraq. The rule of thumb is this: If a Democrat is in office, there is no “humanitarian” mission that the president should withhold U.S. troops from getting involved in. Also, after dropping bombs on people from 30,000 feet, a sitting Democratic president can generally expect the media to ignore the ramifications in favor of more important things — like how much Republicans apparently want everyone to drink unclean water and breathe polluted air. Exactly right… that’s why you never seen the Code Pink morons or in my case, the people who protested outside a local Barnes and Noble every Saturday afternoon. I’ve heard a few leftists refer to an intervention in Syria as a “humanitarian mission” and a few refer to Libya as same. And they, of course, referred to Bush as a “war criminal” and said that Obama “has good reasons. He wants to help the Middle East. Bush just wanted to commit genocide against Arabs.” And yeah, the latter is an “argument” I once heard on Facebook from a moonbat who defended Obama’s Libya War but was critical of the Iraq War. The MSM is good at distracting people, by painting Republicans as “evil.” All the MSM had to do was paint Romney as a member of the He-Man Women Hater’s Club (Our Gang/Little Rascals reference for those who don’t know) who would roll back Supreme Court decisions that were resolved decades ago and drumming up the fictitious “War on Women,” and that enabled Obama to win. It seems that our current administration is more worried about what is popular than what is right. If you look back many times the right thing to do was not popular at the time. 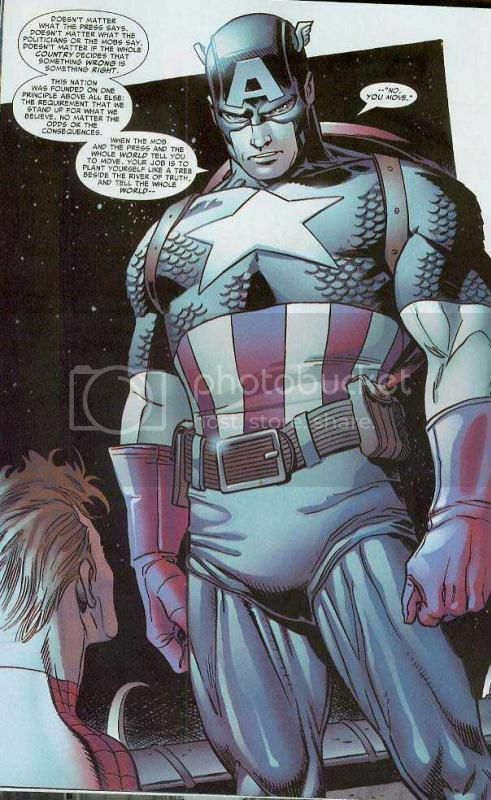 Our current administration needs to take this lesson from Captain America. When given a choice between the easy wrong and the hard right, politicians will almost always choose the easy wrong. Thanks for sharing that panel. That’s a great shot of Captain America giving sound advice. When we struggle ask yourself What Would Steve Do? I do find the hypocrisy of this administration to be astounding. The hypocrisy is indeed astounding. I just find it funny how he’s basically yearning to invade Syria based on reports of their chemical weapons, and how all the Obamanauts are supportive of a potential war in Syria, yet they had the exact opposite reaction in 2003-2004 with the reports of WMDs in Iraq. The whole “Bush lied” nonsense. The same lefitsts also think that it was Nixon who got us into Vietnam, when in fact it was LBJ, a Democrat. In fact, it was during Nixon’s adminstration that we left Vietnam. Well said Carl, people like to remember things they way they wanted things to happen. I cringe every time I hear people say “Bush’s war”. I guess people will believe what they want no matter what the facts are. The biggest revision of history as of late pertains to Afghanistan. Democrats were on board with that in droves, and now years after the fact they act like that part of our national debt (which is nothing compared to our long-term unfunded mandates) is another blunder by Bush. Umm … it doesn’t work that way. I’ll give them Iraq; I won’t give them Afghanistan. I agree, it is funny how much support there was until it did not end up a short term easy win then they were “all against it”. How about the hypocrisy of Biden lately! Impeach Bush…now Obama does the same thing and it is fine.